This article is about Blynk.Inject™️ – a framework for device provisioning that includes Firmware API and a Mobile Connection Wizard to simplify life for your customers when getting device online and for you, as a manufacturer (or developer). Dynamic Auth Token Provisioning is used for devices that can connect to the Internet over WiFi and can act as an WiFi Access Point (AP). For example: ESP8266 or ESP32. Major advantage of Dynamic Auth Token Provisioning is that you don't have to flash Auth Token to every device before it's delivered to your customers. Which means that you can use same firmware on every device while all the provisioning processes is handled by Blynk.Inject™️. Experience starts when your customer unboxes your product and turn it on for the first time. They would also need your app installed on their smartphones. User opens your app and follows the Connection Wizard UI which guides them through the steps to connect the product to their WiFi network. All the steps of Connection Wizard are pre-designed for you. You can customize product icons, provide your own instructions and translate them to a different language. This wizard was extensively tested for usability and connectivity failures and provides 99.9% reliability. 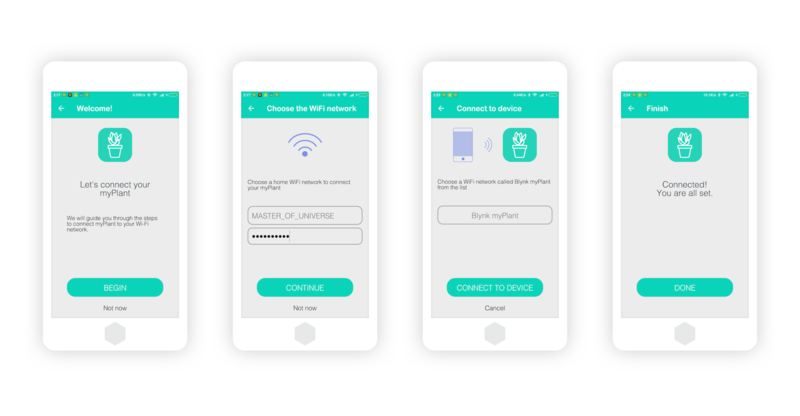 Your customers will choose the WiFi network they want to connect the product to (for example, their home WiFi network) and input password. Device uses the stored WiFi credentials to connect to the user's WiFi network. It no longer acts as an Access Point. How to integrate Blynk.Inject™️ and Dynamic Auth Token Provisioning with your product. Firmware and code templates can be found here. You will be able to experience Connection Wizard your customers would go through and connect your prototype device. Once your prototype is working, you can choose the plan and we will publish your app containing Blynk.Inject. If you have any questions - contact us or post questions on our forum.